There are 8 Assisted Living Facilities in the Angier area, with 3 in Angier and 5 nearby. The average cost of assisted living in Angier is $3,500 per month. This is higher than the national median of $3,346. To help you with your search, browse the 32 reviews below for assisted living facilities in Angier. On average, consumers rate assisted living in Angier 2.8 out of 5 stars. Better rated regions include Fuquay Varina with an average rating of 3.5 out of 5 stars. Caring.com has helped thousands of families find high-quality senior care. To speak with one of our Family Advisors about assisted living options and costs in Angier, call (855) 863-8283. Angier, North Carolina, is a small town in the Black River Township of Harnett County and has a significant elderly population — approximately 10.6 percent of the town's 5,091 residents are age 65 or over. To accommodate this senior population, there are eight assisted living facilities in the Angier area, with three located in Angier and another five in nearby communities, including Fuquay Varina and Lillington. 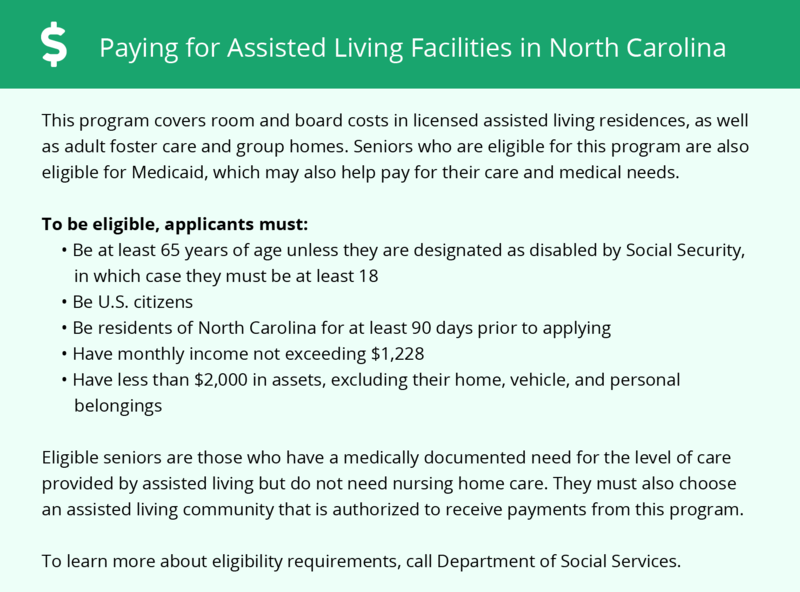 North Carolina officially refers to assisted living facilities as Assisted Living Residences (ALRs), and they are regulated by the North Carolina Division of Health Service Regulation. The climate in Angier is relatively comfortable — some seasons can be wet, as the area receives an average of 46 inches of rain a year, above the U.S. average of 39 inches. Summers tend to be warm with pleasant weather, as Angier has about 214 sunny days a year and average temperatures of 89 degrees in July. The cost of living in Angier is quite affordable, about on par with the state average. On Sperling's cost of living index, which takes into account factors such as housing, utilities and food costs, Angier scores a 97, slightly below the national average of 100 and about on par with the state average of 96. Taxes in North Carolina are relatively moderate. Property taxes are low and the sales tax of 4.75 percent is near the national average. For retirees collecting income from retirement accounts, they can expect to pay the state's income tax rate of 5.499 percent on withdrawals from pension funds, IRAs and 401k accounts. Social Security income is tax exempt in North Carolina. Harnett County provides transportation services through HARTS (Harnett Area Rural Transit System). Seniors can schedule trips up to 48 hours in advance through their Dial-a-Ride program. They're also able to accommodate passengers with physical disabilities. The Angier area is home to world-class medical facilities, including Central Harnett Hospital in Lillington, in the event of medical emergencies or illness. Angier has an array of community resources for seniors, including Angier Senior Citizens, a nonprofit organization that provides companionship and services for seniors, including monthly luncheons with informative and entertaining guests, card games and evening events. Assisted Living costs in Angier start around $3,500 per month on average, while the nationwide average cost of assisted living is $4,000 per month, according to the latest figures from Genworth’s Cost of Care Survey. It’s important to note that assisted living rates in Angier and the surrounding suburbs can vary widely based on factors such as location, the level of care needed, apartment size and the types of amenities offered at each community. 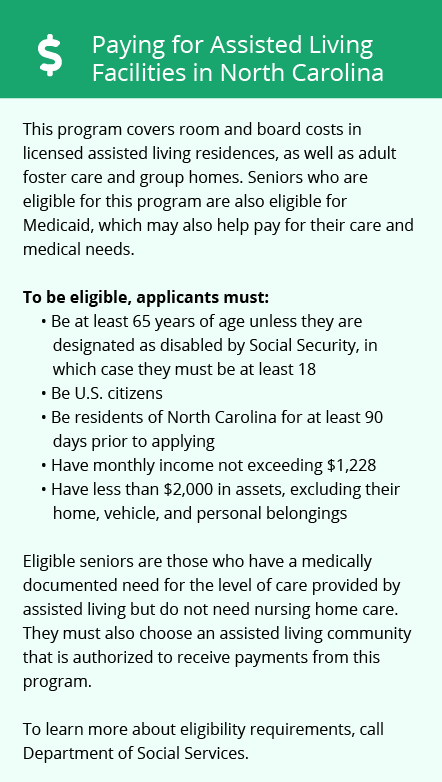 The North Carolina Medicaid State Plan pays for personal care provided to eligible residents in ALRs and Adult Care Homes (ACHs). Angier and the surrounding area are home to numerous government agencies and non-profit organizations offering help for seniors searching for or currently residing in an assisted living community. These organizations can also provide assistance in a number of other eldercare services such as geriatric care management, elder law advice, estate planning, finding home care and health and wellness programs. To see a list of free assisted living resources in Angier, please visit our Assisted Living in North Carolina page. Angier-area assisted living communities must adhere to the comprehensive set of state laws and regulations that all assisted living communities in North Carolina are required to follow. Visit our Assisted Living in North Carolina page for more information about these laws.